The couples - some of them renewing their vows while others were exchanging them for the first time - are worshipers at the World Peace and Unification Sanctuary, also known as the Sanctuary Church. 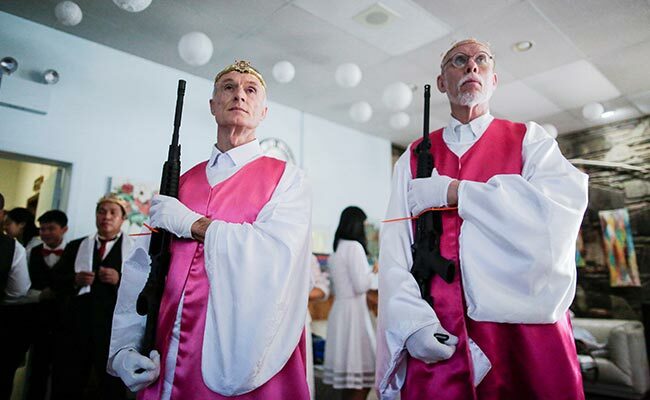 Dressed in wedding attire - but with crowns on their heads and assault-style rifles in their arms - dozens of couples went to a pro-gun Pennsylvania church for a commitment ceremony on Wednesday. 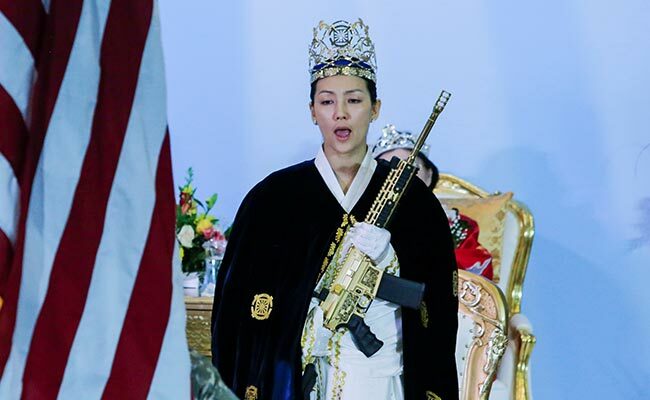 The church, in Newfoundland, Pennsylvania, is led by Hyung Jin Moon, who called on his followers to bring unloaded rifles to the ceremony. 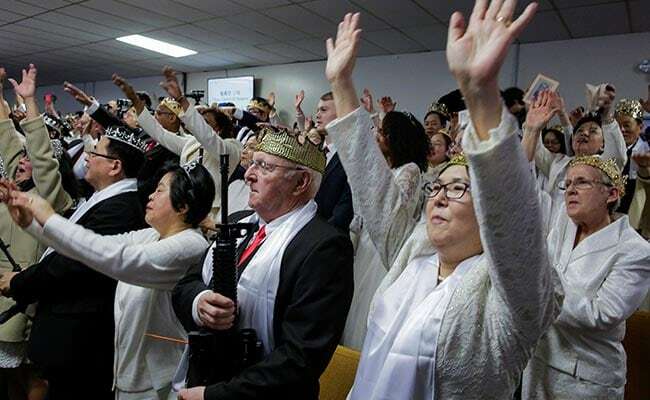 According to the church, the rifles and the crowns (some made of bullets) are the "accoutrements of the nation of Cheon Il Guk" - the sovereign kingdom of heaven on earth, according to the Southern Poverty Law Center. The crowns, says the church, represent the "sovereignty of Kings and Queens." The rifles - similar to the one used in the Florida massacre - are the "rod of iron" that symbolize defending one's family and community. The church, which also calls itself Rod of Iron Ministries, is an offshoot of the Unification Church, founded by Hyung Jin's father, the late Rev. Sun Myung Moon. Sun Myung was a self-professed messiah from South Korea who became a symbol of the 1970s cult wars by holding mass weddings for couples who often were strangers, The Washington Post's Michelle Boorstein wrote. Hyung Jin Moon has woven gun rights into the religious community he leads in Pennsylvania, according to the Southern Poverty Law Center, which calls him an "anti-LGBT cult leader." To their followers, Sun Myung is the "True Father" and his son is the "Second King" - the True Father's anointed heir. 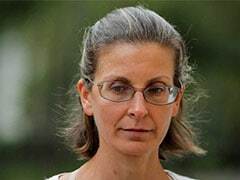 Wednesday's ceremony came amid a pitched debate over assault-style rifles, one of which authorities said was used to kill 17 people at Marjory Stoneman Douglas High School in Parkland, Florida, two weeks ago. The church ceremony raised concerns among officials of a nearby elementary school in Newfoundland, where Wallenpaupack Area School District officials decided to temporarily move students as a safety precaution, although church officials assured that the weapons were not loaded.